Recently I’ve been invited to participate in Episode 2 of the Portuguese Makers Hangouts. Quoting from the webpage, “the purpose of these Hangouts is to gather the Portuguese Makers and get the world to know about their talents and their projects”. They are used to share experiences and create contents around the best of the DIY/Make scene in our country. From 3 to 5 participants are invited for each hangout and their goal is to show the audience their creations, talk about the problems and challenges they had while building them and their lessons learned. Live demos are usually provided :). Anything that mixes creativity and art with technology counts. A robot, a quadcopter, a cool gadget, a 3D printer, a new technique or material, anything that comes out of the inventor’s obsession to create things will do. All the hangouts are recorded, saved, and made available on as many channels as possible. 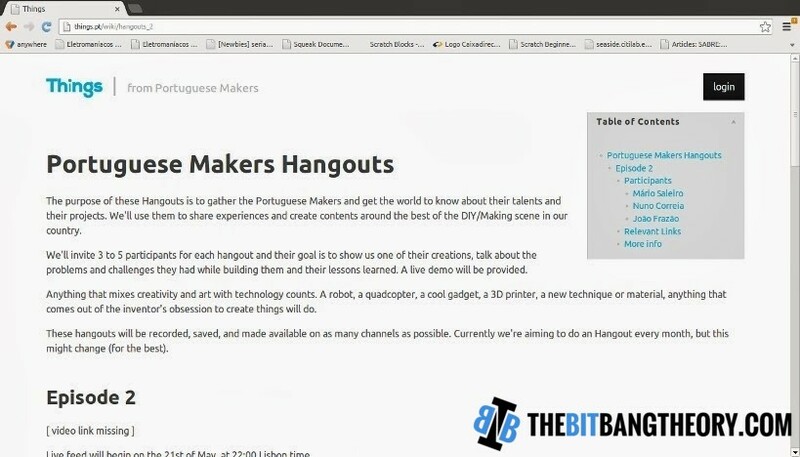 Currently, the Portuguese Makers Community is aiming to do an Hangout every month, but this might change (for the best). In this hangout I’ll be showing and talking about my homemade CNCs, specially TheMaker2, and some robotics stuff. In this hangout there will also be participating the Portuguese Makers Nuno Correia showing his printrbot and João Frazão showing Ziphius (that recently won the Engadget’s Insert Coin contest) and some other projects. The live feed will begin on the 21st of May, at 22:00 Lisbon Time. You can confirm your attendance to the event here on G+. Share this event with everyone that may be interested :). If you wish, you can see the 1st Episode of the Portuguese Makers Hangout here. You can also join the Portuguese Makers community here.